Policeman Roger Renick Warren, Jr.
Policeman Roger Warren was shot and killed by a sniper while on duty. Policeman Warren was on patrol with his field training officer when his training officer observed someone crouched behind a stone BBQ pit and decided to investigate. The training officer directed Policeman Warren to pull over so they could investigate. When the training officer exited the vehicle a gunshot was heard. A round from a .308 rifle struck Policeman Warren in the armpit. The suspect was a 16-year-old thought to be seeking revenge on a liquor store manager who had a friend of the suspect arrested for shoplifting earlier in the day. It is also believed the suspect's intentions for the manager were interrupted by Policeman Warren and his training officer. The suspect was shot and killed by the training officer and an off duty police officer from across the street. Policeman Warren was transported to the hospital and he was pronounced dead as a result of the gunshot wound. 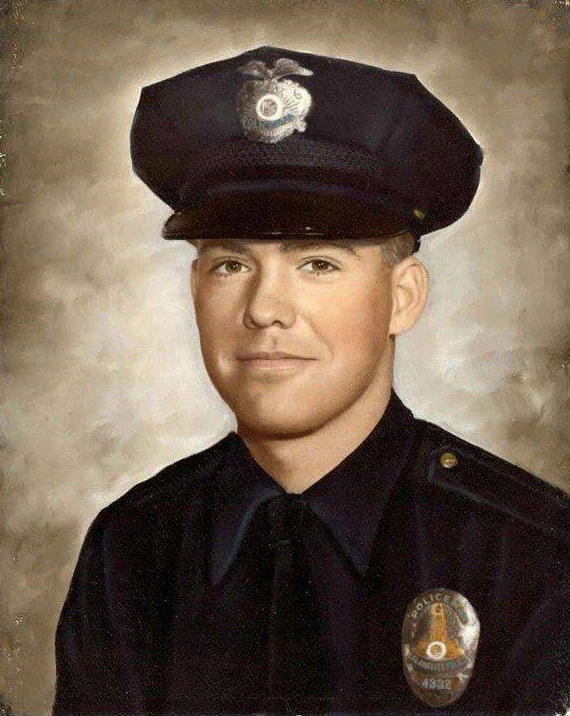 Policeman Warren had served with the Los Angeles Police Department for only one month and was assigned to the Van Nuys Division. He had previously served with the U.S. Air Force Air Police. He was survived by his wife, daughter, two brothers, two sisters, mother, and father. I am so sorry for your loss. I know that even all the passing years don't help much. I happened to read about Officer Warren quite by accident, as I'm sure you know this incident was included in a pitch letter by Bob Cinader for the creation of the Adam 12 TV show. I found it in an online archive. Obviously it was successful and, as you know, that show was the inspiration for a generation of kids to enter law enforcement. Me included. After more than 30 years in the business and the loss of several friends along the way, I suppose I would still do it again.